I try to shy away from creating recipes for weelicious that may come across as being too gourmet or adult (for lack of a better word) for kids. Part of the reason for that is because a lot of parents I know don't think their kids will like foods that seem too "grown up" and so they don't even bother trying to see how their kids will like them. I'm not talking about having a go at getting your kids to eat buffalo for dinner, but the occasional recipe outside of their comfort zone can be really fun, refreshingly delicious, and, who knows, maybe a new family favorite. I'm always a bit shocked when I encounter kids who love olives, but when you think about it, what's not to love? 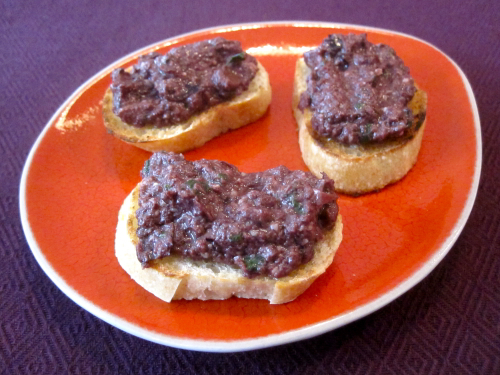 Their lightly salty, briny flavor can be addictive for some people and when the pits are removed, they're perfect for packing into a school lunch or making into a spread (or tapenade) like this one. There are tons of variations on tapenade that I've tried throughout the years, but I added some grated parmesan to this one knowing that the addition of cheese will sell almost anything edible to my son. As per usual, I let Kenya help me measure out the ingredients, whiz them together in the blender and then spread it on bread with cream cheese for his school lunch. But the real surprise was what a big hit it was with my wee one. I couldn't believe how much Chloe loved this recipe from her first bite. In fact, you can watch her introductory taste here. Whether you're serving this to adults on toast points for a get together, to your big kid as a spread on a sandwich or to your one year old as baby food, I find it's an uncommon treat that everyone will love. 2. Spread on toast points, crackers, or on a sandwich and serve. Yum! I cannot believe how good this is....just made it to spread on our buns for mediterranean burgers tonight. So good! Thanks! Hello friends,i am Maggie from USA, i want to thank God for directing my path to a great spell caster when i needed help to fix my home that was at breaking point,my husband suddenly begin to act strange after a couple of years in marriage,he was angry with me and the kids unnecessarily without little or no provocation,this was a real surprise to me and the kids,this began to grow worse when he decided to pack out of our matrimony home for frivolous reasons,words can not express how i felt,we were devastated,i never known my husband had a date outside our wedlock until i visited him in his new apartment and caught him with another woman,he told me he is not coming back to us that he now loves another woman,i consulted a spell caster via Email: [[email protected]] and Call +2349023727004 he cast a spell for me and within 24 hours my husband came back to me and the kids,my family is now reunited with the help of Dr Benson ,thank you sir. why is mine not quite as dark as yours? This is excellent! Can you recommend how long it keeps in the fridge? How about freezing it? Get Your Ex Back! Thanks to Dr. Okuns, Who Help Me Bring Back My Ex Love! you are really a great spell caster, that have the solution for any type of marriage problems. I advice You Everyone, Do You Need Your Ex Lover Back? Do You Need Strong Love? Do you Need A Child? OR You Need A Divorce? Dr. Okuns can help you out. Contact him via E-mail: [email protected] for any types of relationship solutions or WhatsApp/Call his phone number: +2348078467513 He also cure any types of Disease. I am MABEL. by name. Greetings to every one that is reading this testimony. I have been rejected by my husband after three(3) years of marriage just because another woman had a spell on him and he left me and the kid to suffer. one day when i was reading through the web, i saw a post on how this spell caster on this address [email protected] , have help a woman to get back her husband and i gave him a reply to his address and he told me that a woman had a spell on my husband and he told me that he will help me and after 2 days that i will have my husband back. i believed him and today i am glad to let you all know that this spell caster have the power to bring lovers back. because i am now happy with my husband. Thanks for Dr.Alli. His email: [email protected] OR.His WhatsApp Number:+2348100772528. [email protected] or call him on +1(301)909-8775. and share a wonderful testimony just like me. Hello everyone in this forum, i will keep sharing my own experience with what Dr Okoni has done for me, he cure my HIV/AIDS. i was suffering from HIV/aids for more than 3 years until i got the email of this great healer from the Internet and choose to give him a trial to see if he can really help me. to my greatest surprise this man help me with his herbal medicine and now my pains are all gone, i went to the hospital to do some test and the result came out negative. i am free from my HIV/aids sickness and i a very happy now, i will like you to help me thank this great healer Dr Okoni, on his email: okoniherbalsolution @outlook. com or visit his Website:okoniherbalsolution. webs. com, You can reach him through his whats-App +2348146495245 truly here is a really healing home of all sickness. 9. IF YOU NEED YOUR EX LOVER BACK TO LOVE YOU AGAIN. Hi viewers, My husband left me because I have lived with Herpes Simplex Virus for two (2) years and I've been praying to God for divine intervention for my healing and for the return of my husband. But each time i go for test the result remains positive. I then stopped going for further tests and i was directed to Lord Zakuza by my friend in Africa and i got connected to the Doctor and i dived at the instructions that was given to me by Lord Zakuza and he assured me that the virus was going to leave me within 7 days and that my husband will be back too. I believed and had faith in him for i really needed his help. Lo and behold i went for test after 7 days and for the first time, the result was NEGATIVE and immediately, i got a call from husband that's he's home waiting for me. I’m so thankful to God for using Lord Zakuza to save my life & my home. For urgent help of any type, contact Lord Zakuza now via his Email: [email protected] or website: http://doctorzakuzaspelltemple.website2.me or WhatsApp him on + 1 (740) 573–9483. Thank you Dr.Ogudugu for the great work you did for me when my lover broke my heart. Dr.Ogudugu was able to bring my lover that left for about 2 months came back to me within 48 hours. Contact Dr.Ogudugu on [email protected] or better still you can give Dr.Ogudugu a call on WhatsApp +27663492930 for a better understanding for what i just said about him.. I wake up everyday with a smile on my face and singing praises to this powerful spell caster called Dr,UZOYA who has done me a great favor by rescuing my relationship from break up. I used to think that i have a perfect relationship till when my lover started coming home late and everyday he gives me different excuses then i decided to keep a close eye on him then i discovers that he was having an affair with another girl. I was heart broken because i trusted him so much and knowing that he has a secret relationship, hurts me a lot.. But i thank all those who placed the contact information of Dr,UZOYA on the Internet because through that i have been able to contact Dr,UZOYA and today my relationship has been restored with love and more romance than ever before. If you are in any kind of relationship or marriage stress i will do you a favor by dropping the contact information's of Dr,UZOYA which are via email: [email protected] Or Call +13019098775. Hello everyone am jesae by name, i looked forward to be a whole family again with a love spell, I actually got tired of living a depressing life. I was so unlucky that my husband fell out of love with me; he keeps threatening me with divorce paper almost everyday. But all I wanted in our home are positive thinking, love and happiness all the time. I wanted us to be good parent to our kids.When Dr. Bello stepped in with his helping hands via [email protected]ail.com I began to feel lighter on the inside, I stopped having that heavy feeling on my chest during the process of the love spell. Two days after, my husband started exhibiting some positive character. He confessed that he was thinking of me more recently even when he was with his girlfriend. I was overwhelmed when he came to me and apologized for every wrong he has done to me, I also apologized to him as well. Dr Bello. I just want to say thanks for the patience and kindness shown to me during the whole spell process. My husband and I has been living happily after the love spell, none of his ex ever come back. you can also call him on +2348147271779. Grateful to DR UDI for all his help for my life, my partner was having Herpes Simplex Virus, and we were planing on getting married, when we decided to get ourselves tested first and we found out that my Girlfriend was HSV 2 Positive, my Girlfriend was so unhappy, because this was a barrier for us to get married, so i went out to search out a remedy for my partner, and it was so surprising how DR UDI has been a blessing and healing to the masses, after reading about his work on a blog i immediately emailed him: [[email protected] .com] and he wrote back to me that my Girlfriend will be OK and that we will get married the same year also, i couldn't believe it, after doing all that is needed to be done, i was surprise that after 2 weeks of using his medicine my Girlfriend went to the doc and was diagnose negative. For more info contact his email ([email protected] .com) or call or what-app him via +2348051243538 and you will get your illness cure. My Dear friends online, My name is sander And i live in USA, New York, I have to give this miraculous testimony, which is so unbelievable until now. I had a problem with my Ex husband 2 years ago, which lead to our break up. I was not myself again, i felt so empty inside me, my love and financial situation became worst, until a close friend of mine told me about a spell caster who helped her in the same problem too his name is Dr bello, I email the spell caster and i told him my problem and i did what he asked of me, to cut the long story short. Before i knew what was happen, less than two days my husband gave me a call and told me that he was coming back to me i was so happy to have him back to me. The most interesting part of the story is that am pregnant. Thanks to Dr bello for saving my marriage and for also saving others own too. Continue your good work, If you are interested to contact the great spell caster email address: [email protected] or contact him on whatsApp +2348147271779. My name is Kelis anna. Out of respect for you and your spells I must make this testimony know to all. I've been to other spell casters without seeing any result,all they want was after my money. I just wished I came to you earlier,i got the best from you. My ex husband was gone for a year and I went everywhere and other spell casters for help but no result until my friend introduce me to Dr. Bello. After the Love Spell was done, I finally got a calls from him.His spells worked wonders and my husband is back with full of love. It was like a miracle! He suddenly came back with flowers saying that i should for give him,i was truly flabbergasted and shocked when my husband kneel down begging for forgiveness and for me to accept him back..I'm really short of words and joyful,you are a God sent to me and my entire family.. And now i am a joyful woman once again.Thank you so much Dr. Bello. To everyone who is looking for a real spell caster contact Dr.Bello at [email protected] or you call him +2348147271779. Oniha is totally top notch. I would never trust anyone with my problems. He is completely reliable and compassionate and his spells are truly some kind of powerful magic. Oniha has definitely gotten me through some really tough times and my husband who have left me for another woman is now back with me with Oniha spells. Oniha is worth talking about and deserve recognition because is totally a genius. Anyone who needs help in his/her relationship should kindly contact Oniha on [email protected] you can also call or whatsApp him +1(562)469-3086. i assure you out there you will also get your problem solved. I am very grateful for the good deeds Dr Iyoha did for me, I was a HIV patient, everything went bad for me, I couldn’t do things with my friends anymore, I loosed my job, I loosed everything, I was even waiting for death itself, I went searching on the internet and i came across so many testimony of how powerful Dr Iyoha herbal medicine have really helped them get solution from their various diseases, at first i was in doubt till i had to email this great doctor Iyoha I emailed him and he answered me, I told him all problems, he ask me not to worry, that I will be free from the deadly disease, he told me the requirement for me to get his medicine, and told me that he will send the medicine through courier services, I was surprised, because he did not mention it to me before, I paid for the courier delivery service after 5 days i got my parcel delivered to me i was surprise cux i never met such honest man before , he gave me instruction on how i will be drinking the medicine which I did and he asked me to go for a medical check-up after 15 days of usage, I went to the hospital and I did a HIV test, I was tested HIV negative, I was shocked, I asked myself, “is there still good and honest men like dr iyoha out there”? I promised to share my testimony to the whole world, I’m now free and totally cured from HIV, I have a better job and my Life has been so wonderful after getting my healing from this great doctor, I haven't had any symptoms anymore. Dr. Iyoha is great, and his herbal medicine has no side effects. You can reach him on [email protected] website (https://driyohasolutiontemple.weebly.com) call: +1 (407) 337-9869 / Whatsapp: +254755681540 ..